Thomas Katsaros is a simple and funny man. Soon, he realises that he is also a moron and a half. And as if that was not enough, he has to admit being a moron in public because that it's the only way he can explain to the court of law that he was conned into becoming a crook by a beautiful woman. 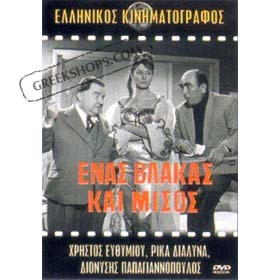 Staring: Hristos Efhimiou, Dionisis Papagiannopoulos, and Rika Dialina. Please Note: This DVD is in PAL format, encoded for use in Region 2 PAL Zones (Europe). To view this DVD in the US or Canada you will need a multi-region DVD player or a computer with DVD player. Greekshops.com is currently offering a multi-region DVD player at the amazing price of 69.95! This DVD player will not only play all zones and DVDs from anywhere in the world, but it also has several other great features which make it a great upgrade of your current DVD player.